Truffles are a type of mushroom that grows underground. They have been sought and savored since ancient times. They have been a cultivated crop since the late 19th century. 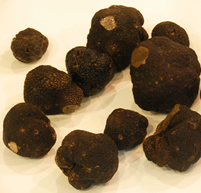 Most truffles cultivated today come from farms located primarily in Spain, Italy, and France. This exquisite delicacy can now be grown in the USA. The most modern and technologically advanced methods are used to produce our plants. Inoculation by RFM™ and production trade secrets are proprietary to the company and are only available to our customers. We not only sell trees, we also are farmers who grow and sell truffles. 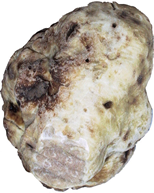 There are four notable species of truffles: the French Black Perigord Tuber melanosporum, the Burgundy Tuber uncinatum, the Italian Alba White Tuber magnatum, and to a lesser extent, the Black Tuber brumale. Of economic importance, but considered by many inferior in flavor, are the Black Summer Tuber aestivum, the Oregon White Tuber gibossum, and the Chinese Tuber indicum.